In Brasso continuo we'll explore the traditions, rituals, stories and folklore surrounding the drum corps activity. If you know of a ritual, bit of folklore or tradition associated with a corps, e-mail the details to content@dci.org. If you have a picture of that particular ritual or tradition, e-mail that as well. Thanks! Jeremy Basso of the Blue Stars sent in this formidable tale. 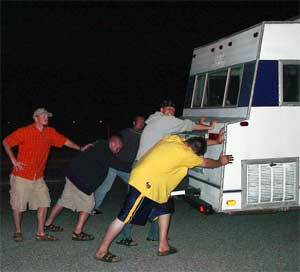 "This is a photo a few members of the Blue Stars staff pushing an old Winnebago to a gas station. We called this fine machine Box 5 for two reasons: 1) obviously, because it was just a big box and had no curves at all, and 2) due to the highest level of performance it gave every night while on the road (Box 5 being the highest level of performance for DCI adjudication sheets). "I wouldn't want drum corps to be any other way. In an activity where the emphasis is on the how much the marching members learn, nothing teaches teamwork like pushing a Winnebago down a Wisconsin highway while listening to the Doobie Brothers." Blue Stars executive director Greg Struve said, "Box 5 made for some great memories, but it also served as motivation to upgrade the Blue Stars' fleet. With the help of several alumni, we're in the process of purchasing some new tour buses to accommodate what will be the largest corps the Blue Stars have fielded since 1981."